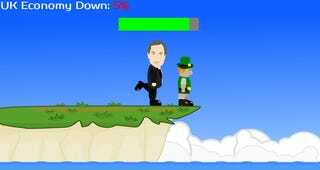 A student game designed "to encourage political discussion amongst young people" has upset UK Independence Party leader Nigel Farage. The game, UKIK (which you can get on Google Play for free), sees a fictional character called Nicholas Fromage kicking immigrants off the White Cliffs of Dover to save the UK economy. Every time you fail to hurl someone far enough, the economy drops a few points. Farage has taken offence, telling The Guardian that the game (which was developed by a sixth form team from Canterbury) was "risible and pathetic" and that it had "crossed the line." The use of the word "racism" was one of the elements he took offence at. The student studio, known as FonGames, include a disclaimer that states, "the purpose of this game is to highlight the importance of a diverse culture for our great nation as well as make a mockery of extremist views." The game's actually been out since May but it's only now popped up in the news after Farage's comments. Streisand effect, right there.